Now with even more travel, this is a bike capable of absorbing punishment and out-racing dedicated downhill bike but at the same time remaining nimble enough to fly on the uphills. 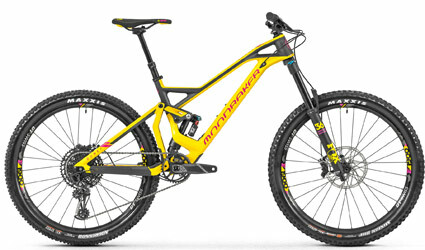 All models feature Mondraker's ground breaking Forward Geometry and Zero Suspension System plus enhanced kinematics, improved pedalling efficiency and a silky 170mm of rear travel. The Dune Carbon R runs a Fox 36 Performance GRIP fork with 170mm travel, Fox Float X2 Performance Trunnion mounted shock, SRAM Code R disc brakes, SRAM drivetrain and a DT Swiss E1900 wheelset complete with Maxxis tyres, bolted with stiff boost axles front and rear.